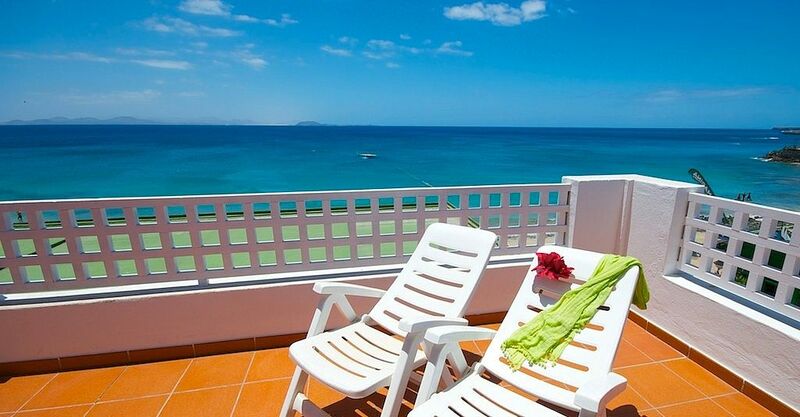 C5691 With spectacular views of the ocean, these two apartments are nestled in the heart of Playa Blanca with the beautiful beach of Playa Blanca under the terrace´s apartments. Recently renovated, with all comforts, each one of the apartments compromises 1 large bedroom with AC and heat, American fitted kitchens, bathroom with walking shower and bidet, large living rooms with patio doors leading to the terraces, with stunning views over the ocean. I've stayed in Playa Blanca many times prior to this visit, but not for about seventeen years. Having searched long and hard for my perfect accommodation - 'perfect' being in the main town of Playa Blanca, sea view, one bedroom but with a double AND single bed or twin beds, decent balcony, near a supermarket, and within easy walking distance of one of the two main beaches - I found the Roca Mar 1 Apartment on Owners Direct. I made contact with the owner of the property, then actually went on to book privately to eliminate the booking fees (some would advise not to do this, but I was satisfied with the reviews and knew exactly where the owner's business was, as they own the restaurant below the apartment). I made the booking with a 50% deposit, then paid the balance, plus a €150 breakage deposit, on arrival (standard procedure for this type of accommodation). We were greeted by the owner's representative, Pam, who went through all we needed to know about the apartment and the area. Pam also gave us a discount card which entitled us to a 10% discount when eating at the owner's restaurant - Da Vinci - plus a couple of other restaurants in the area. There are two supermarkets - Spar and HiperDino - directly behind the apartment. The town taxi rank is located behind the apartment and there is some noise, as you'd expect. I always take ear plugs or listen to music while falling asleep, so this was not an issue for me. There are a vast number of superb restaurants within easy walking distance of the apartment, absolutely spoilt for choice. The south-facing balcony looks out directly over the small town beach, and across to the harbour, from where ferries (Fred Olsen and Armas, plus a smaller operator, the name of which escapes me) depart several times a day to the neighbouring island of Fuerteventura. The huge Playa Dorada beach is a ten minute walk along the promenade to the east, and Playa flamingo, the other main beach, a twenty minute walk to the west. I prefer Playa Dorada beach. Immediately above this beach is the Papagayo Centre, where there are a good number of bars, restaurants and supermarkets. Water sports are available on this beach, but are not an annoyance. I shall definitely return to this apartment, it was absolutely perfect for me. On the day of departure, the apartment was inspected and our breakage returned in full. I uploaded five images, the maximum permitted number per review, of the view from the balcony. Frustratingly, the final review has only shown one of those images. Please watch the video I've linked to in order to see the amazing views from the apartment. Hotel tip: My top-rated restaurants are Camel, Bodegon Las Tapas, La Romantica, and Ninen.